Transition Charity Slays “The Future Dragon Award” at the Hay Literary Festival and carries off the prize. George slew the dragon and carried off the princess, here our LOCAL princesses showed that wooing the dragons, and harnessing their power, was more rewarding, as they carried off the £10,000 prize money. Effectively putting the project on a solid foundation. Tracy Whistance and Anne Bushel made their 3 minute pitch to a panel of 4 judges, including representatives from The Welsh Assembly and National Trust. They showcased the effectiveness, relevance and sustainability of their Environmentally friendly Café Business Model. But they didn’t just woo the judges. The audience rapturously and enthusiastically demonstrated their approval and support, proving beyond doubt, that this is an issue that taps into popular thinking. They are keen to acknowledge the help they receive from all the LOCALs who use the café and attend their events but most particularly to Environment Wales for funding and Andy Middleton at TYF St Davids. 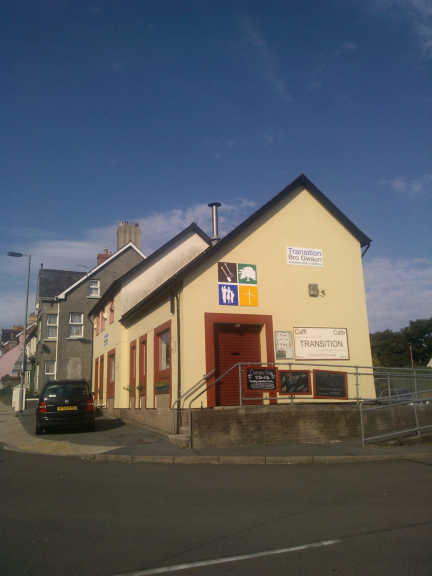 If you would Like to learn more about the LOCAL environment initiatives, why not pop along to the Transition building, when you are next in Fishguard, and experience the hospitality and enthusiasm of all involved. To see the businesses in our Charity Event Management section, please click here.